For those not familiar, City Skies is a monthly electronic music concert series that also has a huge annual festival that draws some of the best ambient and electronic artists from across the USA and around the world to Decatur, Georgia for several days of truly sublime live performances. If you live anywhere in the southeastern United States, we strongly suggest you check out this event and attend live if you possibly can, as it is a singularly great experience. The most recent annual festival was held in May 2010, and among the performers was one of the most creative outside-the-box musical talents that we are aware of. Killer Haven, who also records as Burning Artist(s) Sale and K love, amongst other pseudonyms, put on a fabulous show, taking the audience on an extended journey through the realms of Eno-inspired guitar-oriented ambience. In preparation for his live set, the artist rehearsed his program several times, including several pieces that ultimately never made it to the live stage owing to the limited time slot available. Fortunately for us, he recorded all of his rehearsals, and so these pieces that otherwise never would have been heard are now available for Earth Mantra listeners to enjoy in all their glory. Those who know Killer Haven are already aware of what a creative force he is, with talents ranging well beyond the realms of music and into other media. In fact, Killer Haven's primary canvas has long been the world of video. However, it is precisely the fact that he has artistic expertise in multiple areas that empowers him to produce music with so few rules and such enlightened autonomy. For truly, Killer Haven is his own person, unafraid to follow his muse wherever it leads, into territory that few others have the courage to tread. And he makes it look easy. As is his trademark, the music is quite diverse, ranging from the quirky and angular Medley - Walls/Pipes/Danger, to the profound sentimental beauty of Vermillion, to the hauntingly gorgeous Diminished. The climax of the album is, of course, the rehearsal of the live piece that Killer Haven actually performed, called Final Rehearsal, which is a sweet medium-sized longplayer that takes the listener on a stunning visual trip through the worlds of ambience and experimentalism. Simply beautiful. While listening, it can often be difficult to accept that the music in this release was all performed live, uncut, and with no edits. So what you hear is exactly what the audience would have heard had the artist been on stage instead of rehearsing beforehand. Despite the live improvisatory nature of the performances, the music hangs together skillfully, almost as if it were composed over many days in studio rather than performed by a single person in real time with no accompaniment whatsoever. Truly remarkable, and a testament to the artist's mastery of the ambient form. 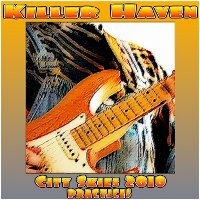 So it is with great pleasure that we unveil City Skies 2010 Practices, the debut album by Killer Haven on Earth Mantra. We think this is music that our audience will love to listen to, time and again, and hope to hear much more from this dynamic artist in the future. Special note: be sure to check out the accompanying booklet, which contains a comic about Killer Haven's experience at City Skies 2010. August 11, 2010 - Aristidis K.
up here on the shores of lake superior i experience a wonderful soundtrack for that visual in your new music.